Creating The Right Leadership Culture explains the important role of the leader in creating, keeping and cultivating the corporate culture with churches and organisations. 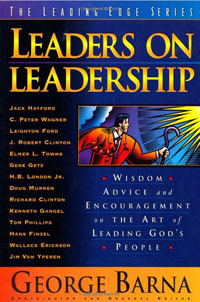 Hans Finzel stated: "Leaders are the prime creators, keepers and cultivators of corporate culture. The founders and/or leaders of an organization create the cultural values that are the trademarks of the group. Whether it is a church, business or local Boy Scout chapter, the leaders determine the values and rules of the working environment. The power to determine how the group will work together and what kind of atmosphere will be maintained lies in the hands of those at the top." In other words, one of the primary responsibilities of leadership is to create, keep and cultivate the corporate culture of the church or organization. However, to create, keep or cultivate corporate culture, you need to understand the values of the organization and the climate of the group that work within the organization. The leader must be able to create, keep and cultivate a healthy culture where people feel fulfilled and empowered. What is corporate culture? Corporate culture is the unseen set of rules and expected behaviors that embody the values of the group. The corporate culture is the environment created by the leaders of an organization or church in which everyone must work. The corporate culture that the leaders create can either foster productivity and success or it can hinder productivity and success. Hans Finzel looks at Seven key strategies for creating the right culture for productivity and success. A compelling vision creates direction - a sense of momentum and forward movement. A compelling vision is something that people can believe in and be committed to. A compelling vision should be based upon the mutual values of the group and agreed-upon destination. A compelling vision is something that the leadership must consider a priority to the organizations productivity and success. Finzel states: "The organizational culture of a group is the way insiders behave based on the values and group traditions they hold. If you are a new leader, your number one job is to study the values and group traditions that make people behave as they do. It will help you lead effectively and it will help enormously in the process of enfolding new members into the group." Don't underestimate the power of corporate culture. You must understand the corporate culture of your organization. The success of your leadership will be determined by it. Finzel states: "Two of the most important words in any leader's vocabulary should be these: 'listen' and 'learn.' Listening means you truly respect your followers. Learning means changing - demonstrating to your followers that you are a change agent and not merely a protector of the institution and the status quo." Leaders must listen long, listen hard and listen often. Do this well and you will combat stagnation and institutionalization. One of the greatest sins of leadership is control. Control freaks destroy morale. Control freaks take away the motivation of ownership. Ownership of an idea, a purpose, a process or an outcome is the key to human motivation. By the way, ownership includes giving people the room to fail. After all, failure is part of learning and developing successful team players. Top down leadership is dead. Leaders today have closed the gap between leader and follower. Leadership accessibility and teamwork are the norms for today. The smaller the ego, the bigger the leader. People are not just there to do our bidding. Give them the respect and the dignity they deserve and soon they will be ready to do anything for you. Be careful, though: respect must be genuine; it cannot be faked. Finzel states: "Corporate culture is the lifeblood of an organization. A fundamental task of a leader is to convey that culture at all times, to all who will listen." To read this article by the original author, click on the following link Creating The Leadership Culture.